The Gallery is situated in The Crofts Pub and hosts a variety of Art and Music for a growing number of amazing performers and intriguing local and international contemporary artists. We pride ourselves on diverse, exciting projects and collaborations with science/art/music organisations, universities and curators. We believe in supporting artists and perfomers to reach an audience from all walks of life. The Gallery is in fact a fully working Skittle Alley with a home team who play regular matches throughtout the year. As an art space it offers an interesting platform to present art in all it's forms. Curators and Artists may take inspiration from the space as a Skittle Alley to create an exhibition or purely as a space for presenting their art. We are flexible and very accomodating to all that wish to put on an event and encourage a non-biased open platform free of cost and commision. Landlord Mark and his team are bringing this traditional Cardiff local right back where it belongs – Into the heart of the Roath community. 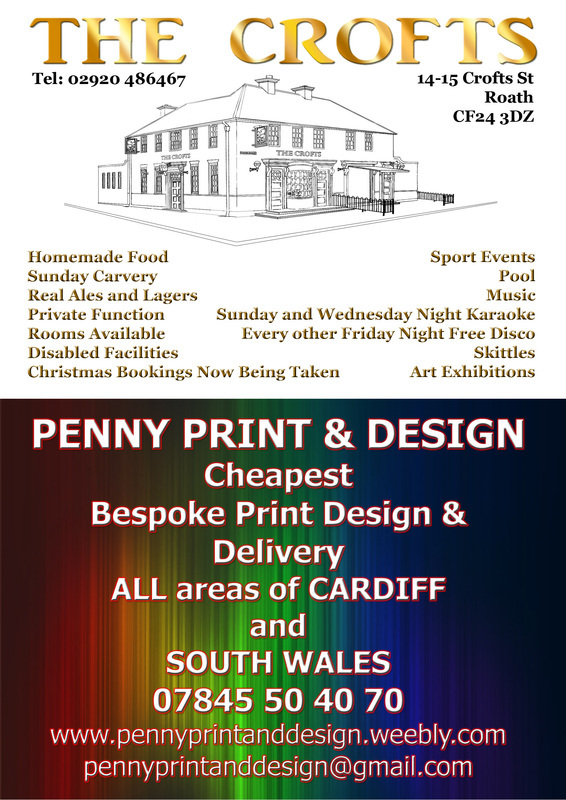 Featuring Live Music, Disco, Karaoke, DJ's and Art events. Great homemade food! Thursday- Saturday and Sunday lunches. Pool Table, Bar, Lounge and Garden. The Crofts is buzzing with newness in the glory of its flourishing flowers and inspiring refurbishments. The Crofts provides the community with a beautiful function lounge for all occasions available for hire, delious buffets, homemade food created by our wonderful chef Lorraine, live music, disco and art exhibitions. I'd just like to say a special thank you to Stephen Walters owner of the The Crofts for making this all possible!